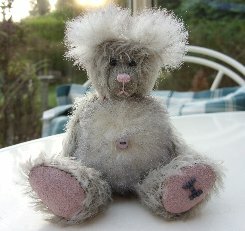 This lovely gentle looking bear is Nymph, he is the latest bear in our Butterfly collection. He is made of quite straight, sparse light grey German mohair with his tummy and ears made of white backed grey tipped Schulte alpaca, soft, very dense and fluffy. For his pads and paws we have used very pale dusky pink ultrasuede and we have also picked this colour out with his stitched nose. Nymph is 5 1/2" tall and is steel shot and steel ball filled for weight. He has shiny black German glass eyes and a pale pink belly button. Despite the grey mohair being quite sparse, Nymph is a cuddly little chap as his tummy is so fluffy. I do hope that you like him, he costs £40 plus postage. Please note that as with all our bears, Nymph is not a toy and is not suitable for children. Sorry - Nymph has been adopted.